Genting Casino - Get from £20 up to £200 + 20 Spins Today! Genting Casino is one of the top online casino operators in the world. The company has more than 50 years’ experience in the industry and has developed, operated and marketed many of the most popular and famous land-based casinos throughout the world, including the UK, North and South America, Singapore, Australia, the Philippines and Malaysia. Genting’s online casino site is outstanding in terms of quality and authenticity. Its live casino employs the latest in HD technology, and by using multi-camera views and real dealers and croupiers, you will savour a realistic casino experience regardless of whether you are playing on a desktop, laptop, tablet or other mobile devices. 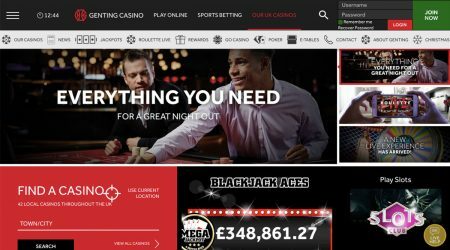 All of Genting’s operations, including its online casino and its online sports betting, are licensed by the Alderney Gambling Control Commission and the UK Gambling Commission. 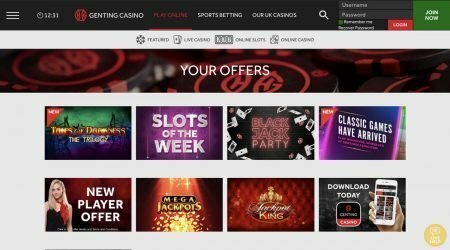 Genting offers new players a welcome bonus and also offers both new and long-term players a variety of other incentives to use the site. Genting regularly updates its welcome bonus offers and provides some generous deals for new players who open an account and make a deposit. Currently, the welcome bonus is a 100% match bonus from £20 to £200 + 20 free spins on Dream Catcher. The bonus will allow you to double the amount of your first deposit, up to a maximum of £200 (i.e. deposit a maximum of £200 in order to get the 100% match, for a total of £400 to play with). The free spins are available after your first deposit is either redeemed or lost. Genting sets a minimum 50 times wagering requirement on bonuses, and it locks the bonus deposit to the casino platform until you meet the wagering requirement. For example, if you make an initial deposit of £100, then you must wager £5,000 before you can withdraw your bonus. The maximum bonus bet is £5. You’ll have 15 days to accept the bonus and then 30 days after accepting to complete the 50x wagering. The free spins come with a 1x wagering requirement. You’ll have 7 days to complete the wagering requirement after accepting the free spins. 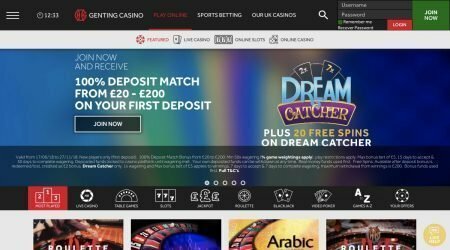 When you make your first deposit, Genting awards you 20 free spins for its Dream Catcher game, as mentioned above. To play this game, a live dealer spins a giant wheel, and you bet on which number you think the wheel will stop on. The numbers are separated by multiplier segments, and if the wheel stops on one of those, then your bet is multiplied as specified by the segment and you get to play again. The multipliers can stack on subsequent spins, so there is the potential for a large payout should the wheel stop on your number after multiple spins. Players who participate in sports betting for the first time are eligible for first-bet insurance. If your first settled bet of £10 or more doesn’t win, then Genting will give you a £10 free bet. Genting also rewards players the more they play via its VIP player structure, which includes monthly cash-back offers, enhanced points, weekly deposit bonuses and exclusive promotions. The VIP Program has four levels: Bronze, Silver, Gold and Diamond. As you progress through these levels, the amounts of your rewards and bonuses increase accordingly. Genting evaluates your playing performance weekly, increasing the speed at which you advance through the levels. Genting has a strong background in the casino industry, and it shows in the quality of the games that the site offers. You can choose from classic games or exciting progressive slots themed on the latest cinema blockbusters. With games powered by technology from Playtech, Evolution, Novomatic, IGT and Amaya, you are sure to have an unforgettable experience while playing the games on this site. The casino’s variety of computerised table games is excellent. Most players will find their favourite games here, and they are arranged in an organised manner, making it easy for players to find the version of the game they are seeking. The arrangement gives the site a professional look. Genting offers sections of computerised roulette, blackjack and video poker that are sure to please. Genting offers more than 300 slots that are sure to satisfy you, and you can even play more than one game at the same time. Novomatic has made some of the most popular slot game titles, and this site has them. Lucky Lady’s Charm and Book of Ra are only two of the ten Novomatic slot titles included on this site. Other top-rated slot games include Wheel of Fortune: Triple Extreme Spin, Da Vinci Diamonds, Cats, Pixies of the Forest, Dolphin’s Pearl, Lord of the Ocean, Sherlock Holmes: The Hunt for Blackwood, Sizzling Hot, Golden Goddess and Columbus. Genting has also added a selection of classic slot games to its mobile slots offering. Titles available exclusively on mobile include Rainbow Riches, Montezuma, Hercules High & Mighty, Amazon Queen, 88 Fortunes, Monopoly on the Money, Spartacus Gladiator of Rome, Raging Rhino, Zeus God of Thunder and 7’s to Burn. 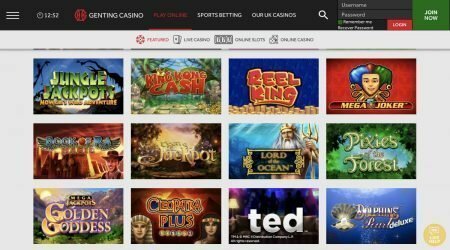 To better give players the feeling of actually being in a casino, Genting has added a selection of 28 live casino games to its site. Live blackjack, poker, baccarat and roulette games will give you the feeling of being in your favourite club. The games feature real croupiers and dealers streamed live to your desktop or mobile device, giving you an experience that is as close to playing in a land-based casino as possible. By using streaming technology, you can take your place at a live table with a real dealer and play your favourite games in real time. Nothing about these games is pre-recorded. You are playing the games with real roulette wheels, real dice and real decks of cards. Genting has set up gaming tables in several casinos, including Crockfords in Mayfair, which is one of the world’s oldest gaming clubs. The selection of live casino games includes Immersive Roulette, European Roulette, VIP Roulette, London Roulette, French Roulette, Genting Live – Roulette, Crockfords – Live VIP Roulette, Baccarat, VIP Baccarat, Genting Live – Baccarat, Crockfords – Live VIP Baccarat, Blackjack, Blackjack Party, Diamond VIP Blackjack, Genting Live – Blackjack, Crockfords – Live VIP Blackjack, Ultimate Texas Hold’em, Caribbean Stud Poker, and Genting Live – Three Card Poker. Genting’s sports betting section is comprehensive. Players can bet on a wide variety of sports, and the following are currently listed on the site: American football, Australian rules, baseball, basketball, boxing/MMA, cricket, cycling, darts, eSports, football, GAA football, GAA hurling, golf, handball, horse racing, ice hockey, motor sports, pool, rugby league, rugby union, snooker, tennis and volleyball. If you are a football (soccer) fan, then the site offers one of the most comprehensive listings of games in the UK, Europe and worldwide on which you can bet. The sports betting section also provides some quick links at the top of the page to help you find events and games that are about to start. This is a very useful feature if you were to place a bet at the last minute, as you don’t have to scroll through the entire site to find the game that you are seeking. When conducting financial transactions online, it’s critical that your personal information and money remain secure, and Genting has assured its customers that the payment system that it uses is secure and trustworthy. This online casino uses the latest encryption technology for all its transactions, thereby creating a site that is both safe and easy to use. Genting offers several options for making deposits and withdrawals. A major perk with using this site is that players are not charged any fees for making deposits or withdrawals. If you are located near one of Genting’s brick-and-mortar casinos in the UK, then you can make deposits and withdrawals for your online account in person. Both deposits and withdrawals are instant, and there is a £50 minimum on both deposits and withdrawals. Genting also accepts deposits and withdrawals using debit cards and credit cards. Debit cards accepted include Maestro, Visa Delta, Visa Debit and Visa Electron, and credit cards accepted include Visa and Mastercard. There is a £10 minimum for both deposits and withdrawals. Deposits are instant, and withdrawals take from three to four business days for UK customers and from five to seven business days for customers from the rest of the world. Genting has an excellent reputation for customer service. It has a dedicated customer service team that you can contact 24/7 with several methods if you need any help. A chat team is available for the live casino games 24/7, except for Christmas Day. Just click on the live chat button and follow the directions to get help for whatever problem you may be experiencing. In addition to live chat, you can also contact the support team via email, or you can request that a member of the support team call you back to answer your questions or address your concerns. Genting provides an exceptionally good online casino experience for players who are UK residents. The combination of computerised online casino games, live casino games and sports betting makes it the perfect choice for players who wish to have the option to do all their online gaming at one site. UK players also have the advantage of conducting in-person financial transactions at any of Genting’s 42 land-based casinos. For international players, opening an account with Genting can be a challenge, as residents from over 80 countries, including the US, Australia, Canada, Singapore, France and Spain, are prohibited from opening an account. If you can get by the geographical restrictions, then Genting is a safe online casino at which to open an account. The company has an excellent reputation, is licensed and regulated by the best authorities, and provides a straightforward casino and sports betting service.